Training a beagle is so important. It will allow you to have a great and fun relationship with your beagle. Read on to find out more! Training a beagle takes a lot of patience. You need to know that it will not happen overnight. And, the first and most important thing to establish is to create boundaries and show your beagle that you are the alpha leader. And, as the owner, you need to put in just as much work as your beagle to gain the rewards. Beagle and Owners Relationship: Firstly you will need to establish a great relationship with your beagle. To do this you firstly need to show your beagle you are the alpha leader. You can accomplish this by eating before your beagle or not showing your beagle attention for the first five to ten minutes after you get home. By establishing this it will lead to your beagle feeling safe and it will also make training your beagle a lot easier. So, establish your alpha leader position before you proceed with further training. Having Fun: By establishing your alpha leader position you will have a much better relationship with your beagle. It will allow you to have a much more fun together. If you do not put these boundaries in place your beagle could get out of control (and that wouldn’t be much fun)! The balance between correction and praise: The first thing to do is to find a balance between correction and praise. You may notice you only decide to focus on trying to stop your dog from doing something that isn’t right. This will create a negative relationship. A dog will not learn if they are consistently yelled. However some owners may do the opposite and praise their beagle too much. The best thing to do as your beagle’s owner is to find a balance between the both – try not to be too negative but then don’t be over positive. Patience and repetition: As previously mentioned patience is one of the most important things you can have when training a beagle. Even smart dogs, such as beagles will not learn things straight away. Repetition is the key! You will need to repeat certain actions over and over again before it will stick to your beagle’s memory. If you give the command to your beagle and they need to stop and figure out what they have to do then you still need to keep repeating the technique. Repetition is so important. Consistency: Consistency is just as important as repetition when training a beagle. You need to stick to what you have taught. You will confuse your beagle if you change things and they may start to misbehave. So be consistent – if you teach your beagle a certain command do not change it later on. It is also important to be consistent with other behaviors. If you don’t want your beagle sleeping on your bed then never ever allow them to sleep on the bed. By being consistent in your rules and training methods your beagle will learn much faster..
Don’t punish for something they haven’t done: If your beagle hasn’t be trained to do something specific then don’t tell them off if they don’t do it right. For instant do not tell your beagle off for chewing on your beautiful mat if you haven’t yet taught them that it is not allowed. You can tell them off once they have been taught about what is okay to chew and what isn’t. Training a beagle can be fun. Do not think of it a chore. Remember, establish your alpha leader position first. By doing this your beagle will see you as their protector and will trust what you teach. Put training into your everyday routine and remember to use repetition. Training a beagle may seem like a big task, but if you put the time and effort in it will greatly benefit you and your family now and in the future. 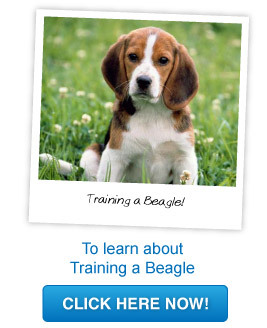 Take the time to start training a beagle today!